Last week we looked at the mechanical make-up of the common rail diesel fuel injection systems that have revolutionised diesel-powered cars (see Common Rail Diesel Engine Management, Part 1). The systems used extremely high fuel pressure, electronically controlled injectors and complex exhaust aftertreatment to provide very high specific torque outputs with low fuel consumption and low emissions. But how does the electronic control system work? In this article we look at the electronics of the system. As with current petrol engine management systems, the driver no longer has direct control over the injected fuel quantity. Instead, the movement of the accelerator pedal is treated as a torque request and the actual amount of fuel injected in response is dependent on the engine operating status, engine temperature, the likely affect on exhaust emissions, and the intervention by other car systems (eg traction control). 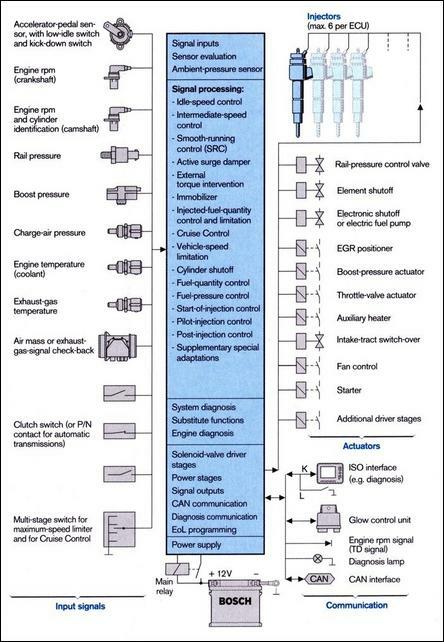 This diagram shows the inputs and outputs of a typical Bosch common rail diesel injection system. 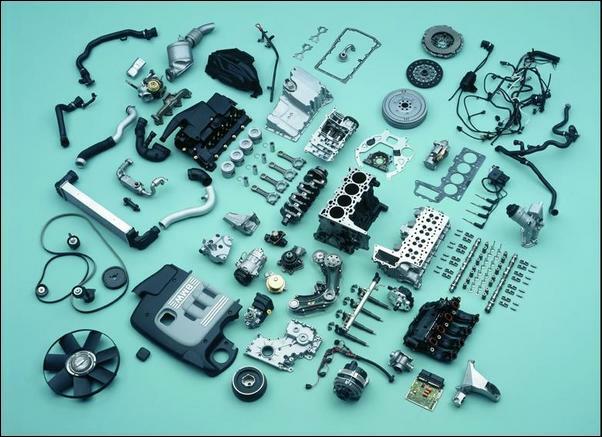 The injected fuel quantity and start of injection timing required for starting are primarily determined by engine coolant temperature and cranking speed. Special strategies are employed for very cold weather starting, especially at high altitudes. In these conditions, the turbocharger operation may be suspended as its torque demand – although small – may be sufficiently great as to prevent the car from moving off. In normal driving, the injected fuel quantity is determined primarily by the accelerator pedal sensor position, engine speed, fuel and intake air temperatures. However, many other maps of data also have an effect on the fuel injection quantity actually used. These include strategies that limit emissions, smoke production, mechanical overloading and thermal overloading (including measured or modelled temperatures of the exhaust gas, coolant, oil, turbocharger and injectors). Start of injection control is mapped as a function of engine speed, injected fuel quantity, coolant temperature and ambient pressure. The set idle speed depends on engine coolant temperature, battery voltage and operation of the air conditioner. Idle speed is a closed loop function where the ECU monitors actual engine speed and continues to adjust fuel quantity until the desired speed is achieved. Unlike a petrol engine management system which usually cuts fuel abruptly when the rev limit is reached, a diesel engine management system progressively reduces the quantity of fuel injected as the engine speed exceeds the rpm at which peak power is developed. By the time maximum permitted engine speed has been reached, the quantity of fuel injected has dropped to zero. 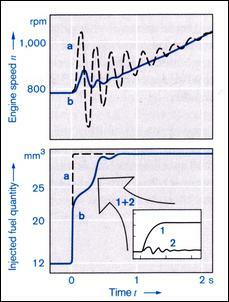 Sudden changes in engine torque output can result in oscillations in the vehicle’s driveline. This is perceived by the vehicle occupants as unpleasant surges in acceleration. Active Surge Damping reduces the likelihood of these oscillations occurring. Two approaches can be taken. In the first, any sudden movements of the accelerator pedal are filtered out, while in the second, the ECU detects that surging is occurring and actively counteracts it by increasing the injected fuel quantity when the engine speed drops and decreasing it when the speed increases. Because of mechanical differences from cylinder to cylinder, the development of torque by each cylinder is not identical. This difference can result in rough running and increased emissions. To counteract this, Smooth Running Control uses the fluctuation in engine speed to detect output torque variations. Specifically, the system compares the engine speed immediately after a cylinder’s injection with the average engine speed. 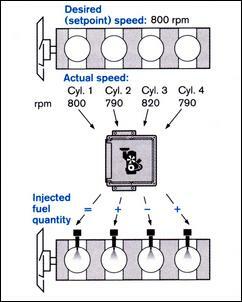 If the speed has dropped, the fuel injection quantity for that cylinder is increased. 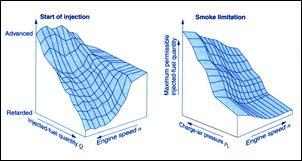 If the engine speed is above the mean, the fuel injection quantity for that cylinder is decreased. As with petrol management systems, diesel management system use oxygen sensor closed loop control. However, in diesel systems a broadband oxygen sensor is used that is capable of measuring air/fuel ratios as lean as 60:1. This Universal Lambda Sensor (abbreviation in German: LSU) comprises a combination of a Nernst concentration cell and an oxygen pump cell. Because the LSU signal output is a function of exhaust gas oxygen concentration and exhaust gas pressure, the sensor output is compensated for variations in exhaust gas pressure. The LSU sensor output also changes over time and to compensate for this, when the engine is in over-run conditions, comparison is made between the measured oxygen concentration of the exhaust gas and the expected output of the sensor if it were sensing fresh air. Any difference is applied as a learned correction value. Closed loop oxygen control is used for short- and long-term adaptation learning of the injected fuel quantity. This is especially important in limiting smoke output, where the measured exhaust gas oxygen is compared with a target value on a smoke limitation map. Oxygen sensor feedback is also used to determine whether the target exhaust gas recirculation is being achieved. 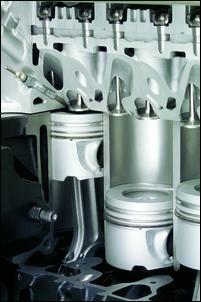 The pressure in the common rail is regulated by closed loop control. A pressure sensor on the rail monitors real time fuel pressure and the ECU maintains it as the desired level by pulse width modulating the fuel pressure control valve. At high engine speeds but low fuel demand, the ECU deactivates one of the pistons in the high pressure pump. 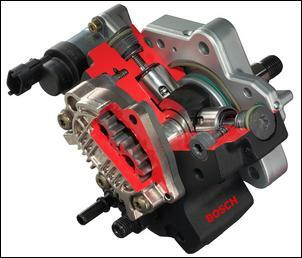 This reduces fuel heating in addition to decreasing the mechanical power drawn by the pump. In the first phase, the injector is opened rapidly by the supply of high current from a 100V booster capacitor. Peak current is limited to 20A and the rate of current increase is controlled to allow consistent injector opening times. The second phase is termed ‘pick-up current’. In this phase, the current supply for the injector switches from the capacitor to the battery. In this phase, peak current continues to be limited to 20A. A 12A pulse width modulated holding current is then used to maintain the injector in its open state. The inductive spike generated by the reduction in current through the injector in the change from ‘pick-up’ to ‘holding’ phases is routed to the booster capacitor, so starting its recharge process. When the injector is switched off, the inductive spike is again routed to the booster capacitor. Between actual injector events, a sawtooth waveform is applied to the closed injector. The current used is insufficient to open the injector and the generated inductive spikes are used to further recharge the booster capacitors until they reach 100V. European car manufacturers and consumers have thrown their weight heavily behind passenger cars equipped with diesel engines. The major improvement in specific torque outputs and the reduction in fuel consumption and emissions have been achieved with sophisticated electronic control of very high pressure, individually controlled injectors.